Private lessons are available in all orchestral instruments, guitar, harpsichord, piano, voice as well as jazz and some ethnic instruments. Students of all levels are encouraged to study privately at Reed. 1. Register for lessons, MUS 101, the way you would any other class. More information regarding academic credit. 2. Complete the MUSIC SCHEDULE FORM. Fees for twelve 45-minute lessons are $540.00. Scholarship aid is available where appropriate. Please contact Denise VanLeuven (dvanleuv@reed.edu) for private study music scholarships. 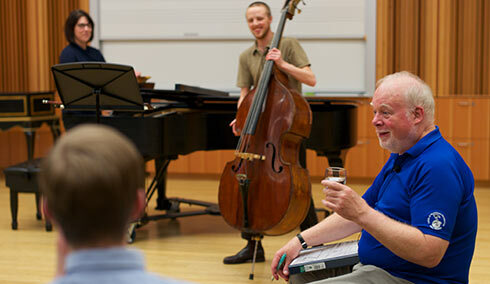 Private instruction fees are waived for junior and senior music majors. Reed also has instructors for a variety of Chinese instruments. Instructors of other instruments are added to the staff as need arises. Can I take lessons if I am a beginner? 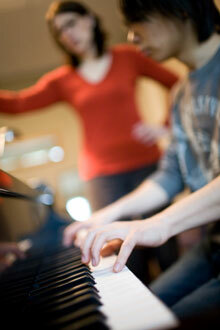 All students are welcome to study voice or instruments with a private teacher. We welcome beginners! If you wish to avoid an overload, lessons can be taken for 0 credit. How do I apply for financial aid for lessons? Financial aid for private study is available where appropriate. Please contact Denise VanLeuven (dvanleuv@reed.edu, PAB 147, ext. 7472) to be placed on the scholarship request list. Scholarships are awarded the first week of the semester. If you are studying piano or percussion you may obtain card swipe access to the locked practice rooms. Please contact Denise VanLeuven for more information. The practice suite is open from 8 a.m. – 11 p.m. for the Reed Community. All students enrolled in MUS 101 have access to the practice suite 24 hours a day.